I have to be honest and tell you that the only reason I probably chose to pick up and read Lilies in Moonlight was because I'm big into 'light and fluffy' reading here in this last month of pregnancy. Suddenly all fiction holds some appeal, whereas most of the time I tend to gravitate towards the non-fiction variety. But we need a little variety in our reading from time to time, don't we? Lily Margolis, a flapper girl out on her own, is trying to make a living. However, she's doing a pretty poor job of it, trying to get by as a door-to-door cosmetic sales girl. She ends up at the home of the wealthy Burnside family where the matronly Mrs. Burnside takes a shine to the girl. Through a rather interesting set of events, Lily finds herself drunk in the Burnside's backyard and is taken into the home to be cared for by the decree of Mrs. Burnside. The love interest, (which you know has to exist), is Mrs. Burnside's disfigured son, Cullen. Cullen was injured in the Great War and tends to keep to himself, feeling self-conscious about his injuries. As you have to suspect, he falls for Lily. The only problem is? She's not a Christian. I give you two guesses as to how their love story plays out. And that's being generous. I started Lilies in Moonlight and was so annoyed by the flippant flirtations of Lily that I wrote my contact at Waterbrook Multnomah and said I didn't think I could finish and review this particular title. It's just not my style. As you all know, I'm not a big fan of Christian fiction as a general rule, but I was interested in giving this one a go. My contact encouraged me to try reading onward, and told me that the character of Lily does make some mature improvements. So, I took her advice and picked it back up. And I even enjoyed it, despite it's predictability! It is not brilliantly written. It isn't anything I would typically read. However, it served its purpose for me at this time quite well. I was entertained. I was curious about Cullen, given his war injuries. He was probably my favorite character in the book because his faith did seem strong and he had been through more, in terms of challenges, which gave him depth of character that I found lacking in Lily. I haven't read many books (if any?) set in the 1920's and I liked the historical aspect of that. I could envision the scenes that Pittman wrote and Lily does improve with time. So I'm not opposed to it, although I do realize I'm not blowing a trumpet sound for this one. I read it. I liked it. I think if you like Christian fiction (which I know a great many of you do!) then you will no doubt enjoy this read. I'm happy to say that Waterbrook Multnomah offered one copy of Lilies in Moonlight to one of you. Would you like to win? Simply leave a comment below. This contest will be open through Tuesday, April 12th and is open to U.S. Residents only. THIS CONTEST IS NOW CLOSED. THE WINNER (as selected by random.org) IS #9 - Pam K. CONGRATULATIONS! For a bit of fun and a good distraction, this book fit the bill for me. I now offer it to one of you. My thanks to Waterbrook Multnomah for sending a copy for me to read. Obviously, these opinions are my own and I'm grateful for their graciousness in letting me give it a try! This time period is my favorite. I would love to read this book. I think I'd like to give this one with my step mom if I were to win. This one sounds good to me! I've not read a book by this author before, but it sounds promising since you said you could visualize the 1920's time period. Thanks for your honest review. I love Allison's books and would love a chance at this one. Thanks for the chance! Sounds like an interesting light read. Don't enter me for the giveaway, but I was just going to comment that Cullen sounds like the most interesting character. You've piqued my interest. I really enjoy reading Christian fiction. Will I like this one? I'd love to win and find out. Hm-Hm-Hm. I can never decide to enter these giveaways. I'm always trying to gauge my relative interest in an item with the whole rest of the world's interest-in/need-for the same item. So... I'd probably read this if I got it. I'd probably never buy it at the store. I'd read it if it were at the library because I'm reading everything that's at the library. But should I enter to win it? It'd probably be entertaining, distracting, just the sort of thing I need every so often. It'd probably distract me from reading all those entertaining, distracting books that are already at my library begging to be read. So should I enter to win it? But since you're into light-and-fluffy reading right now, I figured I'd share what goes through my head every (stinkin') time you host a giveaway! The other one I can think of right now is Julie Lessman's latest in her Daughters of Boston series. The first three are supposed to be a series and then this is the start of the second series, but they all revolve around the same family so I'm not sure you could as easily read it alone as there is quite a bit of backstory woven in. Enter me please. I like this author too. I enjoyed your review and would love to read Lilies in Moonlight :) *Thanks* for the giveaway! The title makes me think of something light and soothing. Love to read it. Sounds like a book I'd really enjoy reading. Please enter me. Thanks! My mother-in-law told me stories about the Flappers and about dancing the Charleston when she was a teenager. This time period has always intrigued me ever since. 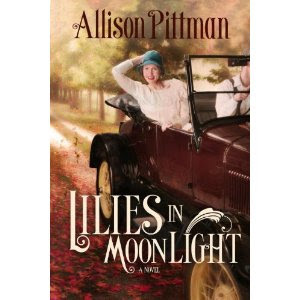 Lillies in Moonlight sounds like a great read.